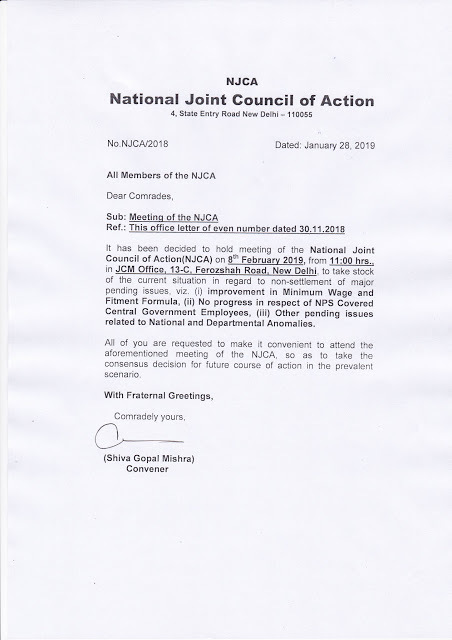 it nas been decided to hold meeting of the National Joint Council of Action(NJCA) on 8th February 2019, from 14:00 hrs. in JCM Office, 13-C, Ferozshah Road, New Delhi to take stock of the current situation in regard to non-settlement of major pending issues viz. (i) improvement in Minimum Wage and Fitment Formula, (ii) No progress in respect of NPS Covered Central Government Employees, (iii) Other pending issues. related to National and Departmental Anomalies. These leaders have sold the stakes of employees to the government… Now they are just befooling all the employees.